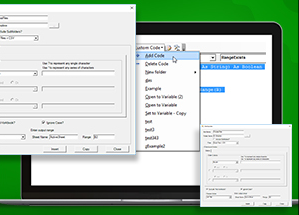 The Procedure Builder (ALT + P) quickly generates a procedure based on your desired settings and inserts that procedure directly into the active VBA code module. 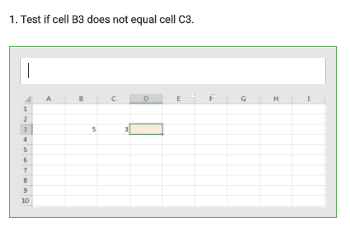 This section will serve as an introduction to Procedures in VBA and contains a walk-through of AutoMacro's Procedure Builder. The Procedure Builder allows you to define default settings that will appear each time you load the Procedure Builder. 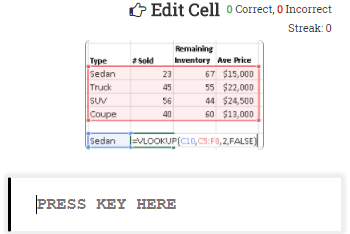 It's great if you're a beginner VBA user: research and set your settings once, and then use the Procedure Builder to generate all your procedures in the future. No more remembering what settings are needed! 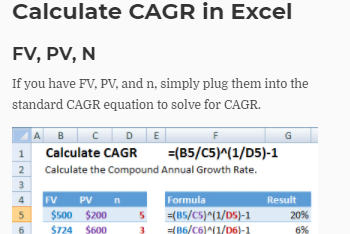 Functions can only be called via other procedures (or Excel formulas). 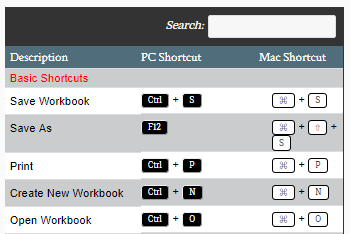 You can not assign a function to a command button or access them via the Macro list. 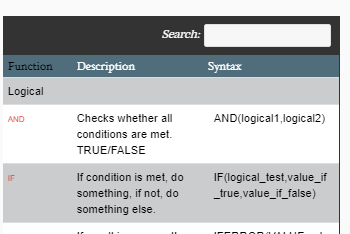 The Procedure Builder will set all Functions to be type Variant. It's important to descriptively name procedures and add comments to describe what a procedure does. Your code may make sense to you now, but it may not make sense to someone else (including your future self). It's best practice to add comments for every procedure you create. 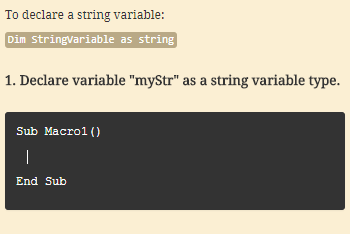 By default, procedures are accessible from the Macro list (subs only), and can be called by any other procedure. 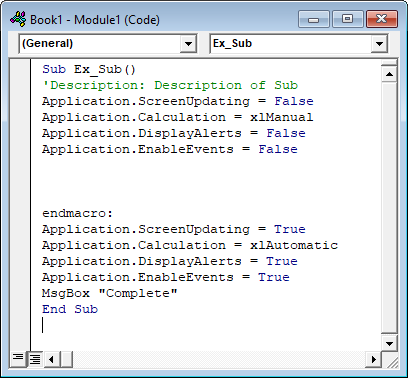 The Private declaration hides the procedure from the Macro List and sets the procedure to be only accessible from the current code module (note: technically you can get around this by using Application.Run). When marking an entire module as private you hide all procedures from the Macro list, but they can be easily referenced from other modules. 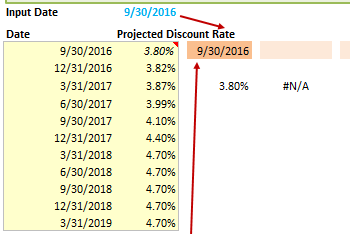 All applications (Excel, PowerPoint, Outlook, etc.) have application-level settings. 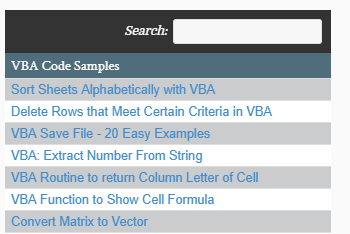 Some of these settings are very important for VBA coding. Important: Application-level settings are independent of procedures. They will not manually "re-set" after a procedure finishes. Instead they must be manually changed again when desired. Note: "Display Message Box After Complete" is not an application.setting, we will discuss it in the next section. Disable ScreenUpdating - The screen will not refresh while the procedure runs. This can drastically cut down processing time. 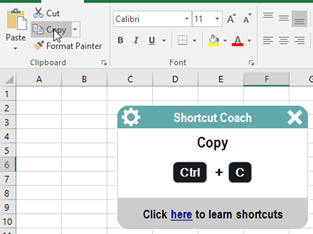 Disable Automatic Calculations - This is an Excel setting that turns off Automatic Calculations. This can drastically speed up processing time. Disable Alerts - Warning messages and prompts will not be shown to the user. Instead VBA will process the default action. Disable Events - Events are "triggers" that can cause code to run (Exs. workbook open, sheet activate, cell change, etc.). If your workbook has events, you probably want to disable events while your code runs to prevent unintended behavior (including endless loops). 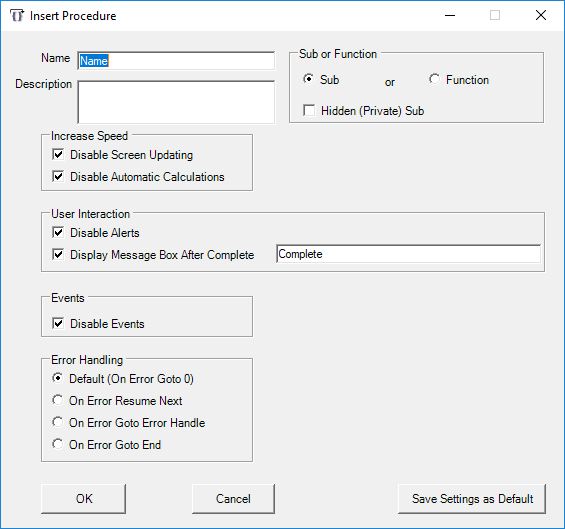 Message Box On Procedure Completion - For procedures that take more than a few seconds to run, it often makes sense to display a message box upon completion. This alerts the user that the procedure has finished running. For our clients, we generally set up message box alerts for all procedures that take longer than 15 seconds to run. Error Handling - By default, VBA will stop executing code if it encounters an error and will prompt a user to "Debug" the code. This is desirable during testing/development. However, there are many scenarios where it's desirable to handle errors in other ways. On Error Resume Next: VBA continues by skipping the line(s) containing errors and proceeds with the next line of code. On Error Goto Error_Handle: On error, VBA will "goto" a defined section of the procedure ('Error_Handle' in this case). This is useful to display a message box on an error, repeat/try again, or skip a section of code. On Error Goto End: This is actually the same as the previous setting, except here "go to" goes to a section at the end of the procedure. This is desirable during testing/development. However, there are many scenarios where it's desirable to handle errors in other ways. Note: It's "best practice" to avoid intentionally allowing errors and using error handling to process them. 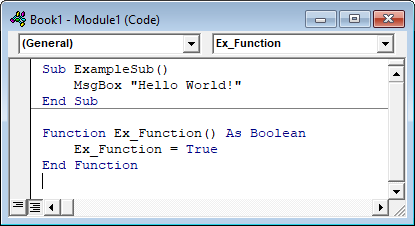 Instead you should use smarter code to avoid generating VBA errors in the first place.